Garmin Edge 500 designed for cyclists, features a grey-scale display and measures speed, distance, time, calories burned, altitude, climb and descent plus much more. Garmin Edge 500 also features Virtual Partner which allows you to race yourself over your regular rides to check your process. Easy to use - simple start-up, with no wheel sensors or calibration necessary. Easy to switch between lines with 18 hour battery life. Garmin Edge 500 has been discontinued. Accessories, spares and parts are still available for your Edge 500. For the latest range of cyling GPS systems click here. Sharpen your cycling performance with Garmin Edge 500, a lightweight GPS-based cycling computer for performance-driven cyclists. Loaded with data, Garmin Edge 500 tracks your distance, speed, location and elevation with high sensitivity GPS. Add an ANT+™ compatible heart rate monitor, speed/cadence sensor or compatible power meter for a finely-tuned analysis of your ride. *NOH - A newly overhauled (NOH) device is a device that was returned to Garmin to be factory refurbished. To read more click here or scroll to the base of this page. The more expensive Edge 500 listed below the NOH model above is brand new stock, hence the saving with the Edge 500 NOH model. They both include and do exactly the same and have a 1 year warranty. The Garmin Edge 500 attaches easily to the stem or handlebars of your bike with its low-profile bike mount. The Garmin Edge 500 attaches easily to the mount with a simple quarter-turn. When you're ready to ride, just power on your Garmin Edge 500, acquire GPS satellites and go. Garmin Edge 500 features a high-sensitivity GPS receiver with HotFix™ satellite prediction to calculate your position faster. During your ride, Garmin Edge 500 measures your speed, distance, time, calories burned, altitude, climb and descent, and records this data for your review. For extra-precise climb and descent data, Garmin Edge 500 also incorporates a barometric altimeter to pinpoint changes in elevation. Garmin Edge 500 works with third-party ANT+-enabled power meters to display your power output in watts as you ride. This valuable data shows you how hard you're working, regardless of conditions affecting your ride, so you can train smarter. When paired with the optional Garmin heart rate monitor, Garmin Edge 500 tracks heart beats per minute and uses your heart rate for advanced calorie computation, so you know how many calories you're burning. Train in a certain heart-rate zone to improve your fitness level or compare your pace and heart rate to past performance over the same ride. Once your ride’s done, connect Garmin Edge 500 to your computer with the included USB cable to analyse your performance. With a simple click, you can join a worldwide network of cyclists and outdoor enthusiasts through Garmin Connect™, a one-stop site for data analysis and sharing. Looking for accessories and spares for the Garmin Edge 500? 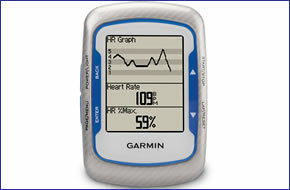 All parts are genuine Garmin product and specifically designed for use with the Garmin cycle GPS 500 device.